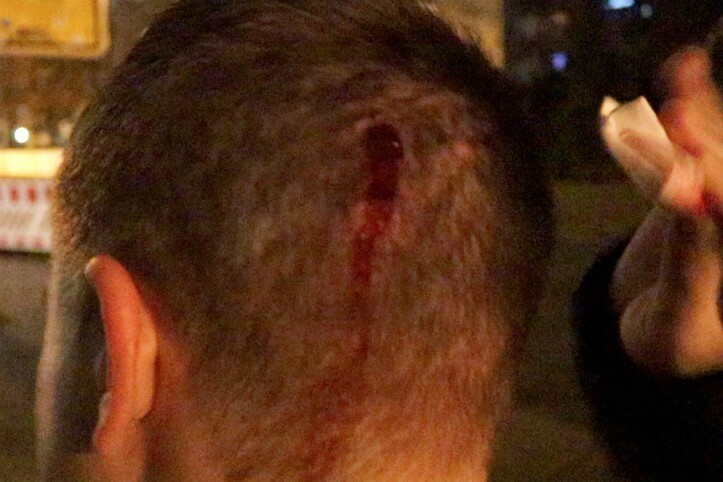 Members of the far-left extremist Antifa movement have been accused of a brutal attack on affiliates of the youth wing of the Alternative for Germany (AfD) including attacking a Jewish member. The four members of the AfD’s youth organisation Junge Alternative (JA) were initially invited to see a screening of a film about the Warsaw Ghetto during the Second World War by the director of the Berlinale film festival Dieter Kosslick at 10:30pm on Sunday night. An AfD spokesman sent a statement on the incident to Breitbart London which included eye witness accounts from the youth group members who were attacked. According to JA Berlin member Vadim Derksen, around “half a dozen” masked extremists attacked them only 50 yards from the theatre showing the film. “They used improvised weapons they can’t be arrested for, but which can do serious damage. They held batteries in their fists to strike with, and one of them had a wine glass which he smashed, and used the broken stem to stab at us like a knife. I was cut in the upper arm and didn’t even notice it till I got home,” Derksen said. Derksen also noted that none of the group was wearing any sort of clothing or symbols that would give them away as AfD members, questioning how the attackers knew who they were and where they would be that evening. The attack comes only a month after AfD Bremen chairman Frank Magnitz was brutally attacked on the streets of Bremen by a trio of masked men who severely injured his head in what was described at the time as an assassination attempt. Shortly after the attack, Antifa extremists allegedly took credit for the incident on the far-left web platform Indymedia. Weeks later another post was made to Indymedia calling for the assassination of leading AfD MPs, giving detailed plans on how to accomplish successful political killings. "viralnewspedia.com" has faith in the dependability news, excitement, governmental issues related site. We give you the most recent certainty news and recordings from each edge of the world.